Dana was perfect! With a short engagement, Dana provided everything I needed to make sure that the day was stress-free and full of laughter and love, which is all I wanted. I am grateful for Dana’s attention to detail and easy-going personality. Big or small, you know she’s got everything handled! I am grateful! Dana was a wonderful coordinator and helped me immensely in planning for and on the day of our wedding. Throughout the wedding planning process, I probably drove her crazy e-mailing her constantly about details and she was not only extremely timely in her responses, she was always willing to help me sort through all the logistics and never seemed bothered by my questions! We live out of state and when we were in one weekend to wedding plan, she took time out of her day to meet with us at one of our vendors to help plan. On the day of the wedding, her and her assistants were a massive help in setting up and organizing the venue and kept the timeline of the event flowing beautifully. Thank you Dana for all of your time, patience, and hard work! Dana was great to work with and was super organized! She was great for day-of wedding coordination. Super helpful, punctual, and prepared for everything! I’d readily recommend Dana to any bride looking for coordination! Dana was great and made my day perfect! I don’t know what I would have done without her! Dana was fabulous! I "technically" only hired her as a day-of coordinator, but she was so much more than that! She was open to email, Skype, phone call, etc any time leading up to the wedding that I had questions! She even drove several hours to meet me at my venue 3 weeks prior to the wedding for a walk-thru, and for us to go over the details of the timeline. She also provided a day-of timeline Excel template for me to fill out, which helped me wrap my mind around all of the different things happening that day & at what time.. However, once I filled out the template I didn't have to worry about the timeline again because Dana took care of everything! While the wedding party was getting dressed, Dana and her assistants set up EVERYTHING (only interrupting me for very minor detailed things, that she knew would drive me mad if they weren't in place correctly!). She also got in contact with all my vendors prior to the wedding, and then received and helped them as they arrived on wedding day. She was also very timely - always early, and responded to emails very promptly. Bottom line, Dana and her assistants were fabulous and I don't know how this bride could've kept her head on straight if it hadn't been for them!! She was very flexible, friendly, and professional. I would definitely recommend!! I had a very long, very diy wedding and Dana pulled it off without a hitch. I was able to relax and truly feel like a guest at my wedding. She kept everything moving during the day and cued the events perfectly. It was the best feeling to walk out from having my hair done and see my vision for the venue set up realized. We could not have pulled this wedding off without her. Even if you think you can do it all yourself, hire Dana and relax! It will be the best decision you make. Day of coordination from A Lark Creation was amazing. Dana made our wedding day run so smoothly and we didn't have to worry about anything! She was so professional during all of our interactions, from our first contact to the walk through at the venue 2 weeks beforehand to the wedding day itself. The day after, my husband and I agree that hiring A Lark Creation was probably the best money we spent in the wedding budget! She really helped make our day perfect and stress free. Amazing!!!!!! DANA IS GREAT! !! Dana was by far the best money spent on the wedding and the best decision made other than my new handsome hubby. She was professional, realistic, and able to keep me calm during stressful times which are certain to arise. She was sweet and was able to keep vendors, and family in check. She was always there when needed, the came up with solutions to problems that I hadn't even thought about yet. I can't express enough how wonderful she was. Any bride who choose another event planner would be doing their self a disservice. I found her through her blog by complete accident. I had my wedding planning 80% complete at the time. I wish I would have found her sooner, and I would have a couple better decisions. 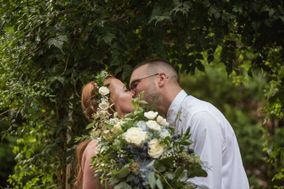 As a wedding planner, Dana holds many redeeming qualities that I know contributed to my overall comfort on the day of, and also how awesome everything turned out. She has the remarkable ability to get you everything you need - and want. She didn't make me feel stupid that I had no idea how to plan a wedding, or what the heck I needed to get it done. I don't know what I would have done without her! Not too mention, that she went above and beyond what I had asked, or expected, to make sure that my wedding day was gorgeous, elegant, and perfect for me and husband. She helped me with pretty much everything - all the little things you don't even think about - tablecloths and silverware and lighting and she helped with big things like theme, my colors, flowers, and gifts for guests. She helped during the ceremony and made sure everyone was in their place and she helped during the reception. She was able to help me, and also help keep the wedding rolling. She is patient and smart and more importantly for a bride, she has a knack for this. You will not regret hiring Dana!